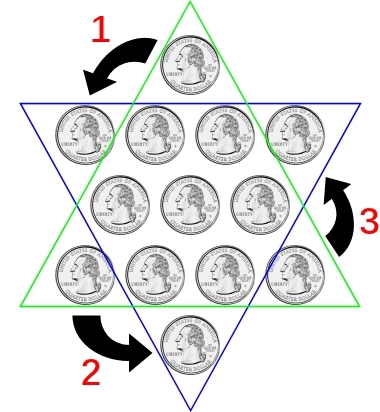 In the illustration below, ten coins are arranged in such a way that they form a pyramid. Can you turn the pyramid upside down by moving just three coins? Note: You can rearrange the coins by dragging them around. HINT: The coins that need to be moved are the ones at the three corners (points) of the pyramid. ANSWER: The green pyramid below is the original pyramid pointing up and the blue pyramid is the new pyramid pointing down. The black arrows show the three coins moving from their original position to their new position.